Child health development – this service is provided in partnership with the Health Visitor. 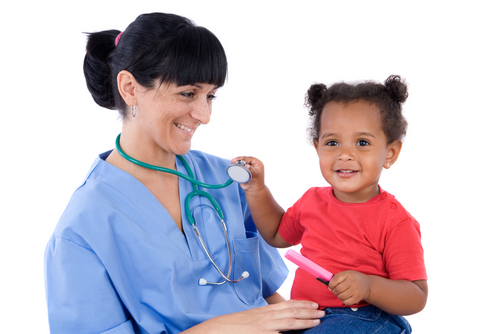 Childhood Immunisations - the nurses can vaccinate your child and are happy to discuss any questions or concerns you may have regarding these. The practice nurses carry out cervical smears. Please contact the practice for an appointment. The service is provided by our healthcare assistants, practice nurses and the pharmacist. We will contact you by text, phone or letter when it is time for your annual review. When you receive your invite, please contact to practice to make an appointment. We offer a comprehensive family planning service including cap, coil and implanon (implant) fitting, and advice on vasectomies for men. Please contact the practice for an appointment. Flu can be serious, if you have a chronic condition such as asthma, diabetes, heart disease, lung disease, epilepsy or are on tablets which suppress your immune system. For these patients, we would normally recommend that you have an annual flu vaccination. Please look out for our flu vaccination open sessions, normally held towards the end of September. Alternatively, if you miss these sessions, you can make an appointment to have the vaccination with one of our HCAs. Please call the practice if you need further information. The shingles vaccination is offered to patients as they reach their 70th birthday and is a once only vaccination. The vaccination programme is relatively new and there is a “catch up” programme for older patients, who may be able to have the vaccination up to age 80. The entitlement rules are quite complicated, so please contact the practice to find out if you are eligible to have the vaccination. Please contact the practice to book an appointment with our practice nurse for advice about immunisation and avoiding tropical illnesses. Please get advice as soon as you have booked your holiday. Injections for a wide range of musculoskeletal conditions. Cryo-cautery (freezing) for suitable skin lesions. Incisions for drainage of abscesses, haematomas and some cysts. We are no longer funded for cosmetic procedures, in line with the East Midlands Adult Cosmetic Procedures Policy. This applies to both cryotherapy (freezing) and minor operations. If we are unable to provide the service, we are able to provide contact details for local private providers. The nurses and pharmacists are qualified to treat a number of minor illnesses. Please ring the reception team to find out more. You can also visit our Minor Illness section on the website for more information and advice.